Last month I talked about what a Sifu is and how this traditional figure from martial lore is relevant in modern times. (You can see that article here). This time I want to talk about the bonds that form between a Sifu and his Disciple students. These bonds are forged over time and through years of close and committed interaction with each other. Traditionally, when a student wished to join a Kung Fu school they would be turned away many times without any reason why. 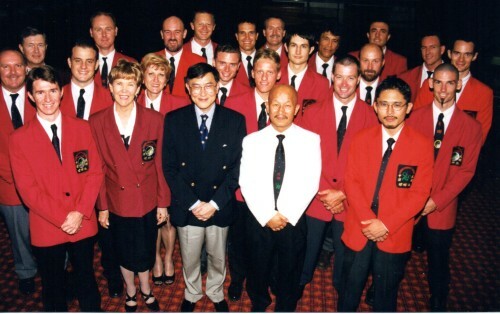 When we visited China’s Shaolin Temple in 2002 with our Sifu, we were told the story of Damo’s first would be disciple, Shen Guang, who spent many years following Damo asking to be taught by him. But Damo refused. One Winter’s night when the snow was falling and after following him for 13 years Shen Guang became very angry and demanded why Damo would not teach him. Damo declared he would teach his practices to him when red snow fell from the sky. So Shen Guang took out his sword and cut off his left arm. Waving his arm above his head the blood sprayed and froze in the night air, falling in droplets like red snow. Thankfully, this level of commitment is not required by modern day teachers! If prospective Kung Fu students showed tenacity and kept turning up to the kwoon after these repeated refusals to join then the Sifu may let them take up menial tasks and train the very basics of his system. This could include cleaning the kwoon and long sessions of horse stance. The less determined may throw their hands up in disgust and walk away, some may have their spirit broken. The reason behind this seemingly underhanded behaviour was to test the mettle of the prospective student with the cleaning and to lay the foundations of power through the horse stance practice. 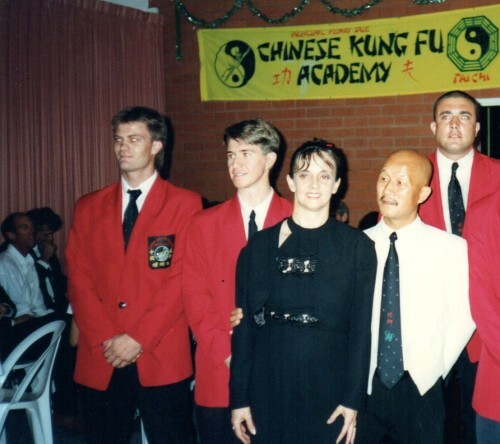 Those that were serious about their learning and commitment to the Sifu would be rewarded with eventually beginning the actual Kung Fu system’s curriculum. After some years of training and showing the correct conduct, character, and commitment, the student may be offered the chance to become a Disciple to the Sifu. This meant a ceremony where the student would kneel before his Sifu and offer him a cup of tea. This ceremony symbolised the two sided commitment from both parties for life. The Sifu takes a very deep interest in his Disciples and treats them with great care while training them strictly in Kung Fu and martial morality. Hence the saying, “If I teach you for a day, I am your father for life.” The Sifu has greater concern for the students’ health, wellbeing, and development as an upstanding person in the community, and less about taking their money in exchange for lessons. The student is committing to regular and dedicated practice of their skills, to helping their younger brothers and sisters in their learning, and being supportive of the Sifu and the kwoon. In our system we have the equivalent of the tea ceremony, although it involves no tea. It is comprised of a Graduation Ceremony when the student achieves Disciple status (their Kung Fu blue belt and a Disciple Jacket) where they will kneel before their Sifu, Sigung, other Masters, Sifus, and several hundred students and family members. It is a big deal. Unfortunately, I think the gravity and depth of serious connection to each other is lost on many a modern day student. It may be seen as just another grading achievement with no greater importance than accepting another belt and its correlating certificate. 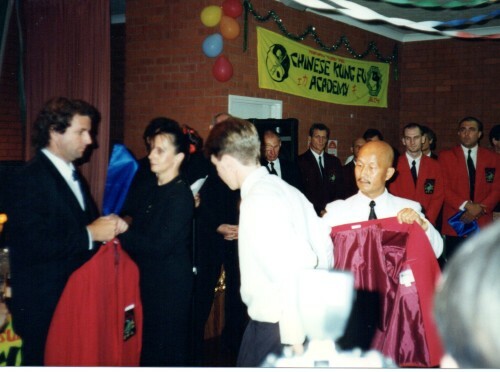 But for me, kneeling before my Sifu, firstly for my Disciple jacket and then my Masters jacket made me think profoundly about my conduct, my character, and my interaction and relationship with my Sifu. I took my responsibilities as an instructor more seriously. I began to seek a deeper understanding of Mou Dak (martial morality). I made more time for my Sifu, when he asked for it and when he didn’t. Over the years I went from a nameless student among many, to being known by my last name, and eventually to a first name basis as a Disciple with my Sifu. There was an invite into the inner sanctum of senior level students and with time, trust, growing respect, and knowledgeable skill levels, I now have a close connection to my Sifu that means so much more than that of a teacher or coach and his student or athlete. This tradition provides great connection, support, and community spirit in the modern world where the family unit dissolves so much more easily. We grow up and fly the nest, not only all over the country but all over the world. We no longer have the ready support and wisdom of our parents, aunties and uncles, grandparents, or older siblings close at hand. A Kung Fu family can provide this and even more than our own family units. We train together in physical arts that must have strong levels of humility and respect to prevent animosity and disdain from developing. The morals, etiquette, and ethics mean the Kung Fu family members will support each other time and time again. Social gatherings often revolve around the practices and self development we strive for in our training, therefore giving meaning to our time together. The Sifu and Simo as father and mother figures will become a part of students’ lives on many levels, offering advice or just an open ear. They should lead by example as people that practice what they preach; by living healthy lives, not asking more of students than they would ask of themselves, and not presenting one face to their students and another to everyone else. So over time very strong bonds are forged between the Sifu and his Disciple level students. Bonds that should not be taken lightly if you understand what they mean to both parties. Bonds that should not be easy to break without great loss or through outside influences. Once broken they may be considered irreparable. These are bonds of a strength, depth, and commitment that may not be forged in any other arts, sports, or friendships (except maybe the military). Sadly, over the last 13 years I have had several of these bonds broken by Disciples and even one I put an end to myself. But these pale into insignificance when compared to the many forged connections with my current Disciple students, whom I respect greatly and will continue to do so for decades to come. Whether they continue to train with me or not, I will be there for them, and am sure they will be there for me. What more can people hope for from each other?